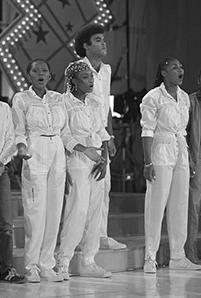 Hitchhiker's Guide to the Galaxy on Boney M.
^ "Fantastic Boney M". Musiclange.dk. Retrieved 2011-10-15. ^ "Offizielle Deutsche Charts: Young, Free And Single". Offizielle Deutsche Charts. Retrieved December 25, 2018. ^ "Maizie Williams official website". Maiziewilliams.com. Retrieved 2011-10-15. ^ "PROLIFIC MEDIA GROUP UK – Music & Design Studio ::: Music Production | Design | Creative Consultancy | A&R | Publishing". Prolificmedia.co.uk. Archived from the original on 6 October 2011. Retrieved 2011-10-15. ^ ""How Shall we Sing the Lord's Song in a Strange Land?" on Everywhere by Yuval Ben Ami". Yuvalbenami.blogspot.com. 21 July 2010. Retrieved 2011-10-15. ^ ""Boney M singer Bobby Farrell dies aged 61", BBC News". Bbc.co.uk. 30 December 2010. Retrieved 2011-10-15. "Baby Do You Wanna Bump"
"Mary's Boy Child – Oh My Lord"
"Hooray! Hooray! It's a Holi-Holiday"
"I See a Boat on the River"/"My Friend Jack"
"6 Years of Boney M. Hits"
"The Carnival Is Over"/"Going Back West"
"Jambo – Hakuna Matata (No Problems)"
"Daddy Cool (Anniversary Recording '86)"
"Rivers of Babylon (Remix)"/"Mary's Boy Child – Oh My Lord" (Remix)"
"Brown Girl in the Ring (Remix '93)"
"Somebody Scream – Ma Baker"
"Hooray! Hooray! (Caribbean Night Fever)"
This content was retrieved from Wikipedia : http://en.wikipedia.org/wiki/Boney_M.